Maureen Kincaid Speller for our 2018 Round-Up feature. In 2018 I forgot for a while how to read fiction. Or, to be more precise, I forgot how to find pleasure in reading fiction. For someone whose daily existence has been defined by the written word since she was five, this was devastating, to put it mildly. While I carried on trying to read, it was as though my brain could no longer accept the existence of fiction in a world that was on a daily basis so bizarre no editor would believe it. Eventually, and I know I’m not the only person who did this, I settled for reading non-fiction and biding my time until the desire to read fiction returned of its own accord. Which, eventually, it did. I’m not here to offer a redemptive story about the novel that saved me, because there was no one novel. Instead, I want to talk a little about what I learned from my year of not quite reading. I am, I discovered, done with genteel dystopias. I keep seeing them described as ‘feminist dystopias’, perhaps because they’re mostly written by women, but I find very little about them that is ‘feminist’ in the ways I understand the word, and too often the dystopic element is a performative means to an entirely different, generally stylistic end. In the past, I never really thought of myself as needing plot, but it turns out that fine writing – oh-so-very-fine writing, in some instances – is not sufficient in and of itself if the plot is practically invisible. By So Mayer, part of our ongoing look back at 2018. So that was the year that Yaz (and Ryan) jumped in the TARDIS. And Meg Murry (and Charles Wallace) found A Wrinkle in Time. Simone took The Good Place (and Chidi, Tehani and Jason) into an MRI chamber. Plus Shuri (and T’Challa, Killmonger, Nakia, Okoye, Ramonda, Ayo, M’Baku, and many more) made Black Panther – and she had a whole lot more to say and do, on Earth and in space, in Nnedi Okorafor’s playful and powerful comic series (up to issue 3 so far). Let’s not forget foresighted Rosalind Walker (and Susie Putnam, and the brilliantly louche Ambrose Spellman) in The Chilling Adventures of Sabrina. Foyles made Tomi Adeyemi’s ambitious Children of Blood and Bone their Children’s Book of the Year 2018, a story of Orisha magic led by Zélie. N.K. Jemisin completed an unprecedented Hugo Award trifecta – three Best Novel awards over three years – with the third volume of the Broken Earth series, The Stone Sky, a mother-daughter-mineral tale resonant with contemporary apocalyptic concerns, which also won the Nebula and Locus awards for best novel. It seems reductive to label this transformation of the field with the hashtag #blackgirlmagic, but it is equally undeniable that the black girl nerd community online has driven the passionate uptake of Meg, Shuri, and Ros, and of writers such as Okorafor, Adeyemi, Jemisin, and Malorie Blackman, who, with ‘Rosa,’ became the first non-white writer to contribute a script for televised Doctor Who, the new series’ highest-rated episode. A BBC adaptation of Blackman’s ground-breaking alternative history novel Noughts and Crosses, co-produced by Jay Z’s Roc Nation company, has started filming, two years after the project was first announced: a strong sign, perhaps, that at the high-profile conjunction of screen media and SFF literature, change is in motion. By Dev Agarwal, part of our ongoing look back at 2018. 2018 feels like it was almost too busy to keep on top of, both inside and outside of the genre. I’m far from the only commentator to say I’ve got sensory overload as we limp into 2019. My reading often lags behind the current zeitgeist but last year I caught a number of new books, or book-length projects, of genre note. 2001: An Odyssey in Words was published to commemorate the centenary of Sir Arthur C. Clarke’s birth. 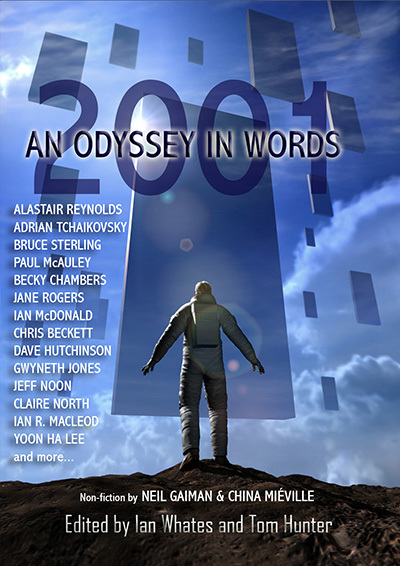 It includes new stories and features of exactly 2001 words by twenty-seven leading SF writers, all winners or shortlistees of the Clarke Award. At a scant 2001 words, the easy gag would be to say if you don’t like the piece you’re reading, there will be another one along soon. But really, this is an extraordinary collection, and there isn’t a duff piece in the lot. Fans of a certain vintage will have grown up following the adventures of the Space Family Robinson who were very much Lost in Space … though this involved being (mostly) trapped on a strange alien world, which happened to be prone to eccentric visitors. Child prodigy Will Robinson often took centre stage, trying to find the best in the conflicted villain Dr Zachary Smith, and often relying on the protection of The Robot. The original Lost in Space was first aired between 1965 and 1968. If we skip quickly past the 1998 film, in 2018 it was the turn of the Netflix behemoth to reboot the show over ten expensively made episodes. Is it worth a watch, and – perhaps more importantly – is it still really Lost in Space? The Robinson family persist, though it’s a more complex setup with Maureen and John now somewhat estranged and Judy being Maureen’s daughter by an earlier relationship. Maureen is very much a central heroic figure, scientist and leader, but she also has flaws – as shown by how far she is prepared to go to ensure Will can accompany the family into space. If the family are updated, so too is the character of Don West, now a smuggling engineer rather than a Major who pilots the Jupiter 2. We still have the Jupiter 2, but now it’s a very well-equipped ship carried aboard a huge colony ship, The Resolute. As the show opens it’s not long before alien robots attack and the colonists must flee The Resolute to an unknown planet. So far, so similar, and there’s even a Dr Smith – though this is a female psychopath played with dark chill by Parker Posey, and she’s really June Harris, who has taken Dr Smith’s identity for her own reasons. If that wasn’t enough to follow, the real Dr Smith is played by Bull Mumy, who played Will Robinson in the original TV series. Once on the planet Will finds and befriends an all-powerful Robot who is a great piece of CGI but not quite in the spirit of the original. Will himself though is very well written and performed, and very much a real Will Robinson, if that means anything. So, this reboot has the main ingredients, and sets them on a threatening alien world with a problem – it isn’t viable in the long term. There’s lots of shenanigans about fuel supplies, treachery and angst and one major difference from the original: the Robinsons aren’t alone! Yes, the planet is temporary home to dozens of other Jupiter ships and their crews. This gives the central cast plenty of other characters to interact with, without resorting to the original show’s device of random aliens just arriving every week. There’s also a bigger story hidden in the background as we slowly learn why The Resolute was attacked, who the Robot is, and how far Dr Smith will go in her deceptions and her lust for power. Her character is consistently well written, and is one of the show’s real strengths. The Robinsons’ interactions drive a lot of the episodes, either reacting to Dr Smith’s machinations, or attempting to escape from the planet, and there are plenty of opportunities to explore backstory, and for Maureen and John to build some bridges. If some of the main characters are updated, this feels less of a departure from the spirit of the original than the failure to leave the Robinsons isolated. But. Yes, there’s a but in the form of a (spoilers) new attack by super alien robots, some narrow escapes and – just as a happy ending looks possible – a surprise turn of events which does indeed leave the Robinsons and the Jupiter 2 truly lost in space. Tony Jones has dined with royalty, supped slings in Singapore and been taught by several Nobel prize winners (though he could have paid more attention). He is a writer and blogger based in the early 21st century. As part of our 2018 Round-Up, Ali Baker shines a light on The Dragon Prince. The Dragon Prince – written by Avatar: The Last Airbender head writer and executive producer Aaron Erhatz and co-director of computer game Uncharted 3: Drake’s Deception Justin Richards – is a high-fantasy animated Netflix series about step-brother princes Callum and Ezran, who team up with a would-be assassin, the moon elf Rayla, after the three of them discover that the last dragon egg, believed to have been destroyed, has in fact been hidden away as a dangerous weapon by their father’s adviser, the power-hungry mage Viren. Callum, Ezran, and Rayla escape from the castle just before the other moon-elves attack and King Harrow is killed. Viren attempts to declare the princes dead and seize the throne, but is stopped after their aunt, General Amaya, reports seeing the princes alive. Viren’s children, Claudia the Mage and Crown Guard Soren, are sent to follow them, but each is given a secret mission on top of returning with the princes and the egg. Rayla, Callum and Ezran encounter other characters along the way, some helpful and some hindering, and they develop skills, talents and inner strength as they overcome dangers and difficulties. The story is an exciting adventure with a fantasy setting written for pre-teen children. In the land of Xadia, where the elves and dragons reside, magic comes from natural sources. However, humans have been driven from Xadia to the Human Kingdoms after a Mage discovered Dark Magic, which exploits the powers of magical creatures, leading humans to enslave them. The war between the two countries has been going on since that time, although the egg could end it, as it would provide a guarantee of ongoing magical powers. It is clear that Viren has his own reasons for not wanting magic to continue. This is not a perfect show by a long way. 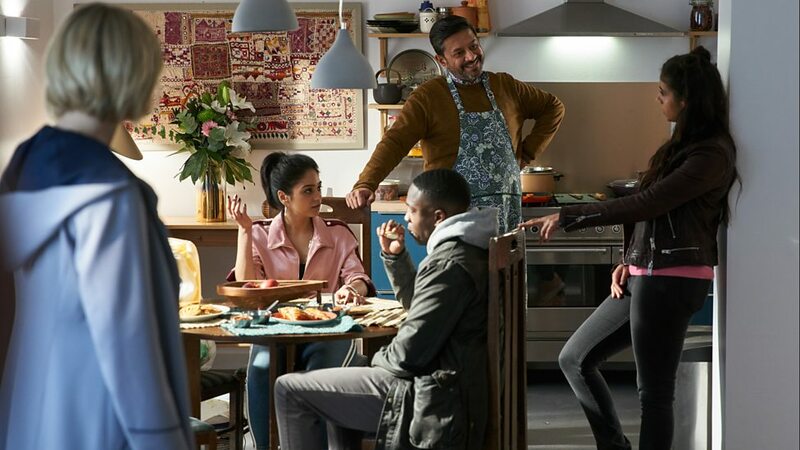 At nine episodes it rushes through the story, and Callum and Ezran’s characters are not given much chance to develop and remain rather stereotypical. Callum is the artistic older brother, who is not much good at princely arts of swordplay and horse-riding, but discovers he is a mage. Ezran is the fun-loving, rather greedy younger brother, who has a humorous pet, the glow-toad Bait. However, the conflicted elf assassin Rayla is a truly intriguing character, and I hope that we learn more about her in the next series. I did particularly enjoy the very visible inclusion in the series. In an era where only 1% of children’s books published in Britain in 2017 had a protagonist of colour, according to research carried out for the Centre for Primary Literacy, it is wonderful to see a Black King, a mixed-race child protagonist, a stepchild who is not neglected and abused; the children’s aunt, their late mother’s sister Amalya, is a general in the King’s army who uses American Sign Language and has a translator. Giancarlo Volpe has said that the girl Ellis who joins the dragon’s egg protectors with her wolf Ava is based on Tibetan heritage. None of these inclusive depictions are plot points: they are just there for children to notice, or not. My stepson and I look forward to the second series. Ali Baker is a lecturer in Early Childhood Studies at the University of East London and a researcher in children’s fantasy literature. She is the Programme Chair of Eastercon 2019, Ytterbiumcon. To subscribe to Vector, join the British Science Fiction Association. Membership is open to anyone in the world. Members receive Vector, FOCUS, the BSFA Review, special one-off publications, and other benefits. The BSFA is a nonprofit organisation, entirely run by volunteers. Disclaimer: The contents of the Vector site reflect the views of their respective authors, whether editors or guest contributors. They do not reflect official BSFA policy or positions.